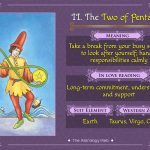 The Three of Swords is a card that belongs to the fourth suit (Swords) of the fifty-six cards called Minor Arcana in a traditional seventy-eight tarot card deck. The card is used for both playing and divination, and its suit element is air. 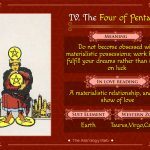 A hard-hitting message is illustrated in the Tarot card where a red heart hanging in the air gets pierced by three swords at the sides and center. The swords have penetrated so deeply that they come out from the bottom side of the heart. In the background, a heavily cloudy and grey sky is pouring thick drops of rain. The 3 of Swords symbolizes heartbreak, rejection, and grief arising from an unexpected occurring in life. The heart signifies emotion, beauty, and love while the swords piercing it stands for power and ability to kill them. The cloudy sky is a symbol of sadness while the rains represent emotional outburst. It represents a sentimental and soft-hearted person who would have been hurt due to a personal loss or rejection. Because such people are highly insecure, they could be sometime dominating and jealous. 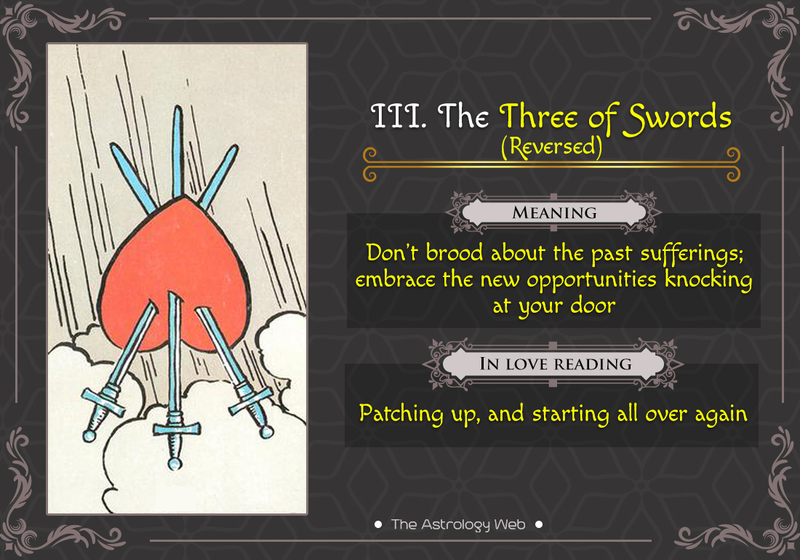 If someone you know is stuck in past, grieving about a heartbreak, it could the 3 of Swords. 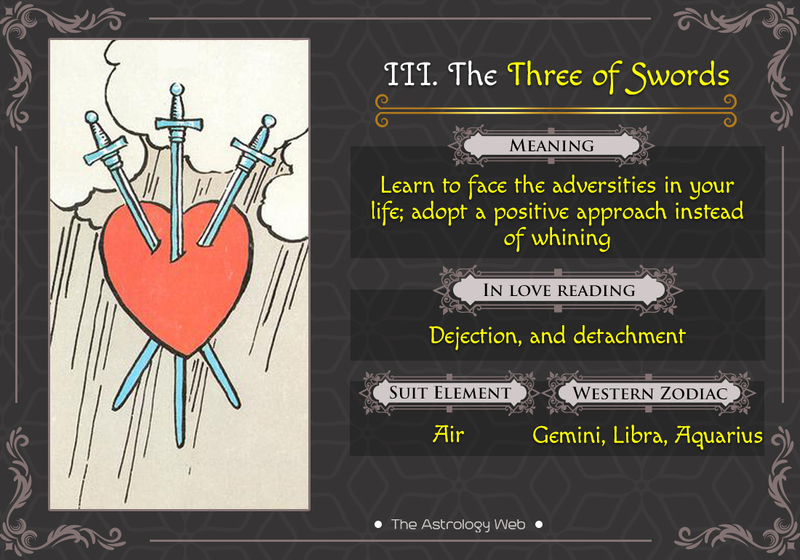 Dejected and loneliness are the common feelings associated with the Three of Swords. Also, you could be locking up your pain in your heart for too long that should be released. Sometimes, it’s important to live with pain, especially in those situations where you cannot do anything about it. The bright side of experiencing and bearing grief is that you will become stronger. 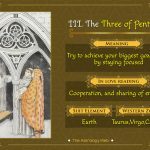 Interpretation: Appearance of the card in this position could mean that you are surrounded by unpleasant and sad events, having no other option than to face them. For a while, your life seems to be meaningless without any hope of recovery. 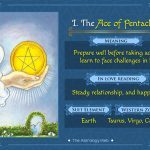 The card reminds you of the necessity of undergoing pain and crossing hurdles as opportunities come with a fair share of challenges. If you develop a positive outlook and mentally prepare yourself, the emotional blow will be less painful. Interpretation: If you are in a relationship, your relationship will be subjected to a lot of worse moments. To sustain it would be your greatest challenge. If you are single, don’t just get involved to drive away loneliness. You may end up getting cheated and hurt again. Career and Work: Redundancy at work and undue pressure may compel you to take a serious decision about your job continuity. If career is the cause of your grief, you need an open conversation with your superiors. Finance and Business: During this phase, you are unable to manage yourself financially well. There might be loan issues or even an alimony tension going on in your head. You need to relax and chart out a feasible plan. Health: Your sadness and depression are the contributors of your deteriorating health. As nobody can help you with your personal problems, it would be better you learn to cope with them and make a fresh start. Interpretation: In the reversed/upside-down position, the 3 of Swords indicates that the time of grief after an end of a relationship, death of a near one, or separation has passed. You are now slowly recovering from it, accepting the pain without any remorse. If you suffer emotionally, don’t try to get stuck in the moment and increase the distress. A new life is waiting for you with a host of opportunities to shine in life. Interpretation: You will be able to forget all the bitter events and look forward to a new beginning with your better-half. There would be more space for communication that would help in healing the past sorrow. Career and Work: You would be feeling more confident about managing the responsibilities at work. It could be because the troublemakers are longer in your office or you have learned to handle them. Finance and Business: You are trying to come in terms with your financial difficulties, finding a new hope to revive. Any old debts or payments should be paid off as soon as possible before you run into a major loss. Health: Since you are optimistic about your well-being, all the minor health issues will gradually take a positive turn. Past: In the former years of your life, you must have been a victim of intense depression and anxiety that may have affected your current life. Do not waste your time sulking and instead consider the past events as learning experiences. Present: Unless you are able to find the reason for your unhappiness, there cannot be any progress in your life. You might be committing some mistakes that may seem alright. However, on the further analysis, you could discover the flaws. Future: In this position, the card indicates that you should stop pressurizing yourself. If you think you are nearly drained out, stop and relax a bit.